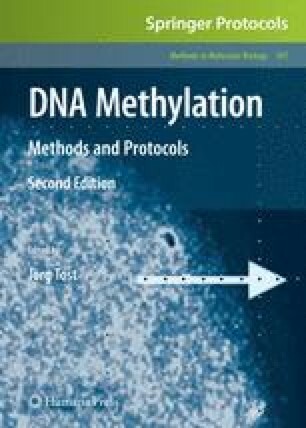 Differential methylation hybridization (DMH) is a high-throughput DNA methylation screening tool that utilizes methylation-sensitive restriction enzymes to profile methylated fragments by hybridizing them to a CpG island microarray. This array contains probes spanning all the 27,800 islands annotated in the UCSC Genome Browser. Herein we describe a revised DMH protocol with clearly identified quality control points. In this manner, samples that are unlikely to provide good readouts for differential methylation profiles between the test and the control samples will be identified and repeated with appropriate modifications. In addition to the step-by-step laboratory DMH protocol, we also provide a detailed description regarding DMH data analysis. The suggested microarray platform contains 244,000 probes and it can be a daunting barrier for researchers with no prior experience in analyzing DNA methylation data. We have created a data analysis pipeline available in a user friendly, publicly available interface, the Broad Institute’s GenePattern software, which can be accessed at http://bisr.osumc.edu:8080/gp. This permits scientists to use our existing data analysis modules on their own data. As we continue to update our analysis algorithm and approaches to integrate high-throughput methylation data with other large-scale data types, we will make these new computation protocols available through the GenePattern platform. Pearlly S. Yan and Dustin Potter contribute equally to the work described in this chapter. We thank Dr. Christopher Hopkins (Agilent Technology) for advice on the design and handling of the Agilent Human CpG Island ChIP-on-chip Microarray Set, Drs. Ramana Davuluri, Hao Sun, Greg Singer, Joseph Liu, and Yi-Wen Huang (The Ohio State University) for technical support. This work was supported in part by the National Cancer Institute grants CA110475 and U54 CA11300, and by funds from The Ohio State University Comprehensive Cancer Center-Arthur G. James Cancer Hospital and Richard J. Solove Research Institute. DP is partially supported by an NCI Training Grant T32-CA106196-03.